As much as I love travelling, there is nothing better than coming back to your own bed knowing that you will be warm, comfy and feeling secure under soft stonewashed linen sheets. For years, I checked the beddings and mattresses in all the nice hotels I slept in as an attempt to achieve the same level of comfort in my own home. I feel I have finally achieved this. and finally stonewashed linen bedding. 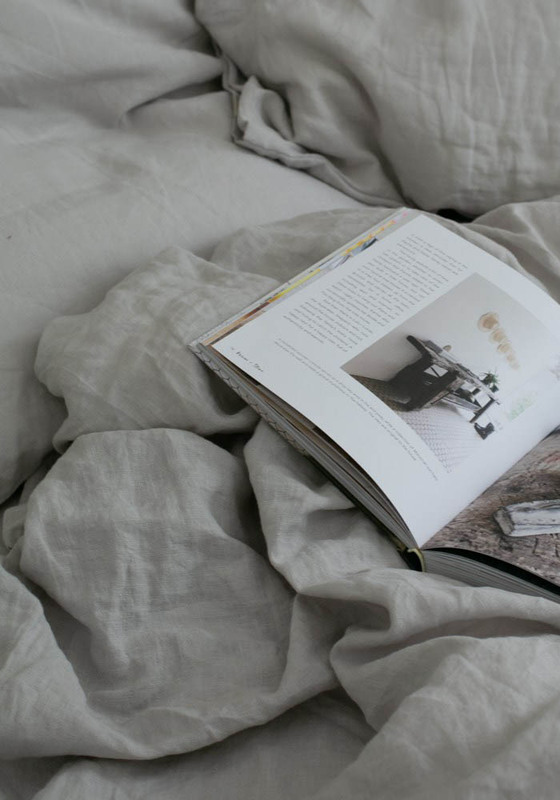 Besides the effortlessly chic look of naturally crumpled fabric which suits my interior style, I’ve never achieved with cotton duvet covers, the level of comfort I get from stonewashed linen bedding. I guess it’s a matter of personal tastes but I’m team #stonewashedlinen. Before the Summer holidays, I discovered the beautiful linen collection by MagicLinen. Based in Lithuania, they ship around the world. Their collection includes organic, eco-friendly stonewashed linen in various colours. Having recently re-decorated our bedroom (makeover post coming soon), I was after some stonewashed linen in a soft, neutral colour. They have wonderful hues and striped linens but I fell in love with this light grey stonewashed linen duvet cover, which luckily they had in UK sizes. In fact, they also have EU, US, UK and AUS sizes which works great for me because, after 23 years in London, my bedding collection is a mix of UK & EU sizes. Following my mum’s advice who strongly believes that for each bra, we should purchase 2 or 3 knickers and for bedding, we should get 2 sets of pillows for one duvet, I also ordered 4 pillowcases in light grey and a fitted sheet. When I received my order, I was delighted by the colour which is a really light grey, almost natural. Having slept in them for a few weeks now, I absolutely love how soft they are. I have purposely focused on close-ups here to keep the reveal of the makeover under wrap. I wanted to give you a feel of the quality and softness of Magic Linen collection, which hopefully you can get from my pictures. Disclaimer: All the linen bedding was gifted to me by MagicLinen but all views are my own. PS: From tomorrow (02/10/2019) til Monday 15th, NET-A-PORTER is running a promotion to get 15% OFF your order with code FASHIONFIX15 Now is the time to get a few Isabel Marant goodies.